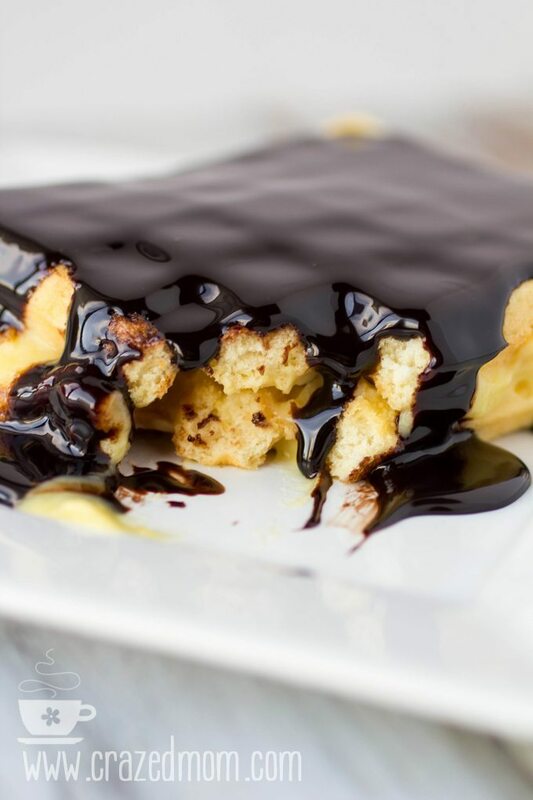 Boston Cream Pie Waffles, Luscious, silky pastry cream sandwiched between two vanilla Belgian Waffles covered with a rich, smooth chocolate ganache. They are more dessert than breakfast, but … who cares? It’s our little secret. Go ahead! Welcome to this week’s theme, we have brought you a slew of wonderful Waffle Recipes. I brought these simply sinful Boston Cream Pie Waffles. These were born from my love for Boston Cream Pie. I’m pretty sure that Boston Cream Pie must’ve been my dad’s favorite dessert. I could be wrong, maybe there was something else, but I remember getting Boston Cream Pie a lot as a kid. It quickly became one of my favorites too, and my family can attest to that fact since I either buy one or make one at least once a month. Yes, I might have a problem. I can eat a huge slice for breakfast with my coffee. And not feel terribly bad about it. It’s a bit of an obsession. So … why not make some Boston Cream Pie Waffles? Right? Make sure to check out these other AMAZING Waffle Recipes! Ready to make your own Boston Cream Pie Waffles? A luscious, silky pastry cream sandwiched between two vanilla Belgian Waffles covered with a rich, smooth chocolate ganache. In a saucepan, bring the butter, milk and light cream to a boil. In another bowl, combine the sugar, cornstarch and eggs in a bowl and whisk until ribbons form. Once your butter, milk and cream boil, whisk in the egg mixture and bring to a boil again. Allow to cook for 1 minute past boiling. Pour into a bowl and cover the surface with plastic wrap. Chill at least 2 hours but overnight is optimal. When you remove from fridge, whisk to smooth out and add the rum. Heat the cream in a small sauce pan over medium heat. Bring just to a boil, as it's starting to bubble, but not froth, pour the chopped chocolate in and then whisk until nice and smooth. Remove from stove and allow to cool for about 10-15 minutes or until you see it thicken up a little. Start with two Belgian Waffles, and slather the pastry cream on one of them. I make sure to push it down into the crevices of each waffle crater and then slather even more on top. Put the other waffle on top. It's ok if some escapes. Pour the chocolate ganache over the top of the waffles and allow to slowly start dripping down the sides. Haha—at least making this waffle version may be more socially acceptable for breakfast! And a scrumptious breakfast at that! I think I might hang out with your mom! 🙂 haha Thanks Liz!! That is gorgeous!!! I can practically taste it just looking at the pictures! Why not indeed?! What a clever idea! 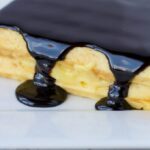 My husband’s absolute favorite dessert is anything Boston Cream Pie – won’t he be surprised when I make these for him?! Thanks for sharing! They are amazing Marion! Thank you so much and let me know how he loves them! I adore Boston Cream Pie! OMG, as one who loves everything Boston Cream Pie, I would wolf these down in a heartbeat! Can’t even tell you how amazing they were!! Huge BCP addict! Another wonderful creative idea! I can’t get over all the lovely waffles this week, Nicole. 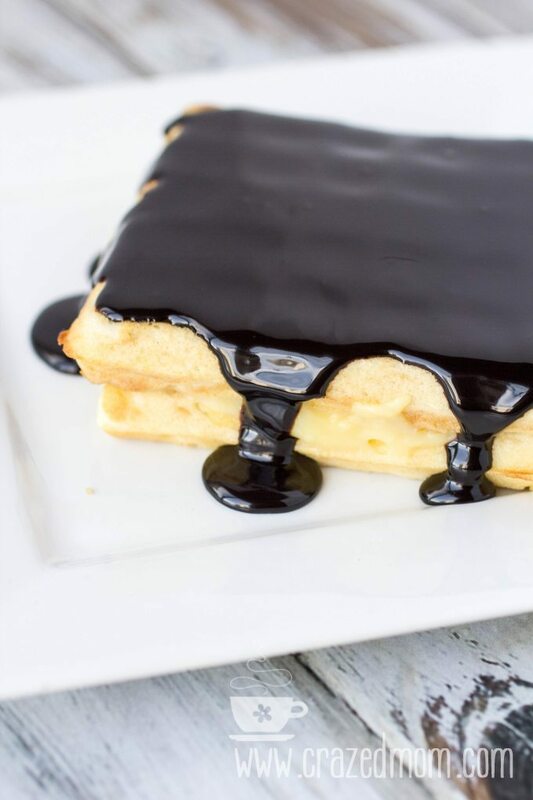 Your Boston cream pie waffles are one of my favorites! Who could resist these? I would LOVE to grab a forkful right now. I love any excuse to eat dessert for breakfast. The pastry cream and chocolate look fantastic! I was not obsessed with boston cream pies… but now I think I might be. Do you think it’s contagious?! I am not going to rest until I have these waffles! Rum huh, hmmm…. I’m sold on the flavors! WOW! 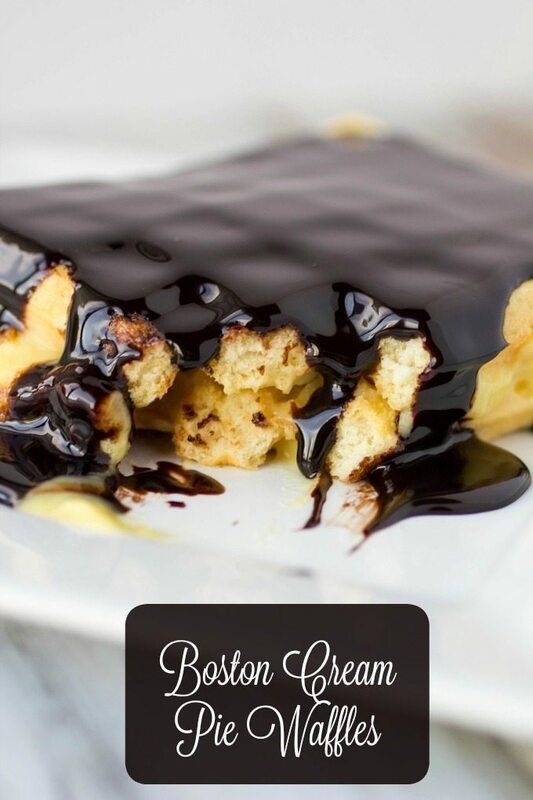 Love Boston Cream Pie and these Waffles sound amazing! Dessert for breakfast is one of the best ways to start a day. It puts a smile in the tummy, right? And when the main ingredient is waffles it truly counts as breakfast…P.s. How wonderful that you’ve got memories of your father mixed in with scrumptious Boston Cream Pie. I’ve never had a Boston Cream Pie. :X When it comes to donuts I don’t like anything oozing out of them. But in waffle form, I’d be happy to try it! They’re simply beautiful. WHAAAAAAT??! oh my gosh. 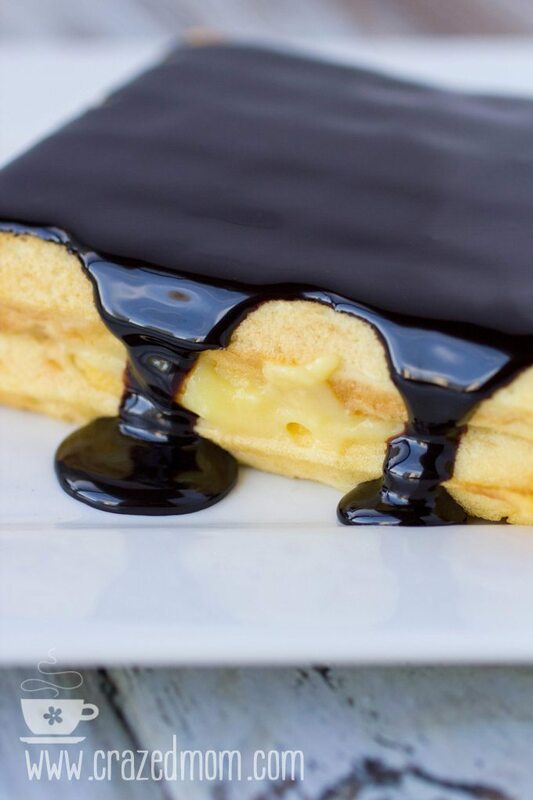 seriously-these waffles look out of this world–I love boston cream pie!